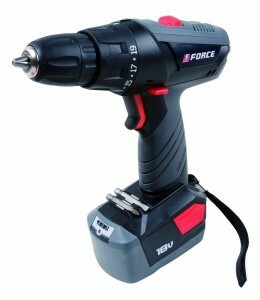 The Force 18-Volt NiCad Cordless Drill is designed as a budget cordless drill for homeowners. Unfortunately, upon review it seems this drill is a poor choice for its target audience. The Force 18-Volt NiCad Cordless Drill is rightfully in the lowest price bracket for cordless drills. Because it is a cheaper drill it is expected to have lower quality parts and less features than an average cordless drill. However, the quality of the Force 18-Volt NiCad Cordless Drill parts are less than that of the average cheap drill. Numerous consumers have reported a burning smell when using the Force 18-Volt NiCad Cordless Drill, and even more users have reported the drill is not powerful enough to complete medium sized projects. With 1.5 amps of power and a reported maximum of 1300 RPM the Force 18-Volt NiCad Cordless Drill is statistically lowed powered in today’s cordless drill market. User reviews regarding the Force 18-Volt NiCad Cordless Drill report the chuck is weak and susceptible to becoming loose during use. Other owners of the Force 18-Volt NiCad Cordless Drill complained about the quality of the bits included with the drill. If you need a budget drill, don’t buy the Force 18-Volt NiCad Cordless Drill. We recently presented what we feel is the best drill for homeowners and included our pick for the best budget drill for homeowners. Whatever budget drill you settle on, make sure you do the research yourself to make sure it is the right drill for you. « What is the Best Drill for a Homeowner?